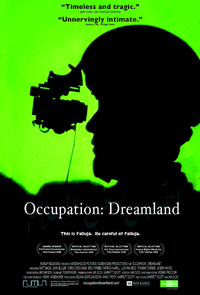 Occupation: Dreamland is an unflinchingly candid portrait of a squad of American soldiers deployed in the doomed Iraq city of Falluja during the winter of 2004. A collective study of the soldiers unfolds as they patrol an environment of low-intensity conflict creeping steadily towards catastrophe. Through the squads activities Occupation: Dreamland provides a vital glimpse into the last days of Falluja. The film documents the city's waning stability before a final series of military assaults began in the spring of 2004 that effectively destroyed it. Filmmakers Garrett Scott and Ian Olds were given access to all operations of the Army's 82nd Airborne. They lived with the unit 24/7, giving voice to soldiers held under a strict code of authority as they cope with an ambiguous, often lethal environment. The result is a revealing, sometimes surprising look at Army life, operations and the complexity of American war in the 21st century.